In a valiant effort to illustrate the frustrating drama associated with the mundane task of downloading or buffering something off the internet with your smartphone, Del Campo Saatchi & Saatchi & Saatchi Buenos Aires has crafted a magical piece of creative. Likening the frustration of watching the dreaded progress bar -- in this spot represented by YouTube red -- to being chased by all manner of horror such as an angry mob, a speeding locomotive, a swarm of bees and an army of rugby players, Del Campo gleefully, and in dramatic slow motion, perfectly represents the maddening practice of waiting for something to download on a slow connection. 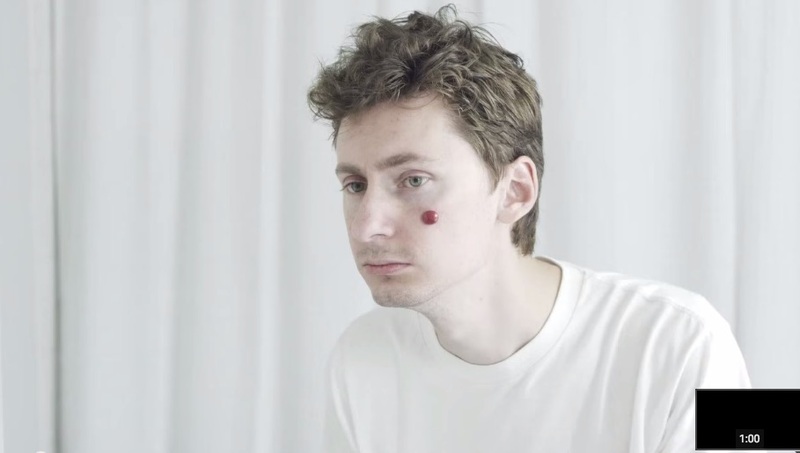 Working with Innocean, Dallas-based candy store Atomic Candy is out with a very Skittles-like commercial in which a guy, looking at himself in the mirror, realizes, he's got a zit. But the zit is actually a piece of candy. He squeezes the candy, it falls into the sink and then he eats it. If your stomach isn't turning at this point then you probably should watch the rest of the commercial. Because it's like the biggest zit explosion you've ever seen. So, yea, it's just a candy commercial but still. OK, silly teaser headline aside, this latest Thai Life Insurance ad, much like those that preceded it, may bring a little moisture to your eyes. While not as gut wrenching as previous efforts, the story of a little boy who aspires to be a garbageman is inspiring. Why? Because that's what his mother does. And she has a tough time of it because of a leg injury. Which is why the boy skips school to go help his mother. - They're kind of a snooze but if you want to watch all of the new Dollar Shave Club TV ads, they are here. - Yet another weird (and very good) ALDI Australia ad created by BMF. - Right in line with the odd approach Dollar Shave Club took with its collection of new ads, JWT New York is out with a very manscaping-centric commercial entitled Crib in My Pants. Seriously the weirdest shaving ad you will ever see. But, damn, that "first girlfriend" is of the charts cute! Could the Model In These New VW Jetta Ads Possibly Have A More Gigantic Smile? Normally when an agency creates work for a brand, they want the consumer of that creative to focus on the message contained within the ad for that brand. But sometimes, without anyone intending to do so, there's an element within a given ad that sometimes garners more attention that it should. 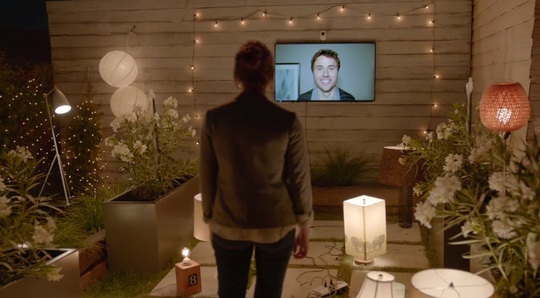 In this case, it's the gigantic smile on the model in two new Deutsch LA-created ads for the new VW Jetta. 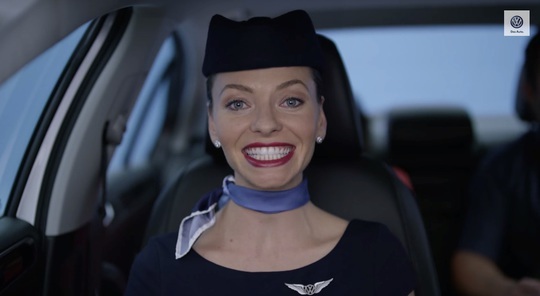 Of course the concept, which features a flight attendant (the aforementioned person with the gigantic smile) in the passenger seat reeling off the automobiles awesome features...as if she were doing that whole inflight safety thing...is perfect. Why? Because the spots will be airing in-flight on JetBlue, United and Frontier now through New Year's. Great teeth! Uh, I mean, great ads. OK if there were one example of how technology can actually intertwine itself with love, life and the pursuit of happiness, this CP+B-ceated spot for WeMo would represent. In the ad, a woman returns home. Her husband isn't there but an elaborate anniversary message is...all powered by remote controlled WeMo home automation products. If you're a hopeless romantic like out man in the video, you can check out the How Dan Did It video to create an anniversary (or any special moment) celebration of your own. There's a new trend in town. Well, at least Down Under. Yea. Weird grocery store ads. Likely, you've seen the latest oddities from Aldi in Australia. 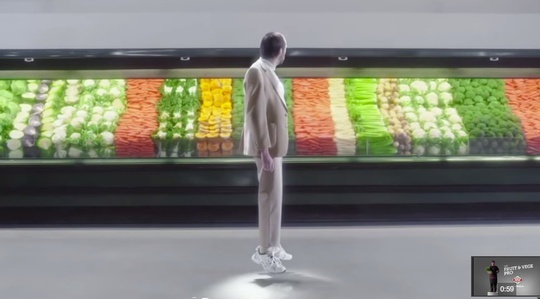 Now we've got new ads from ColensoBBDO for a supermarket chain called New World. Offering up yet another proof point that Millennials are just a bunch of whiny-assed punks with no regard for what came before them (oh come on, we stereotype), Reebok is out with a new two minute ode to its Reebok Classics entitled "Give Me Your Classics And I'll Show You the Future." In the video a British youth begins by parroting back the laments of his elders saying, "Around here, we used to make things...change the world. We were pioneers, innovators." It's been, what, like five years? Maybe six? Either way, those lovable Kia Hamsters are back again, this time touting the brand's new electric vehicle, the Kia Soul EV. In the ad, created by David&Goliath, our fury friends are in the lab working on a new vehicle. When they are ready to make the final, magical adjustment, one of their normally-sized furry friends rolls into the lab and gets zapped along with the car. 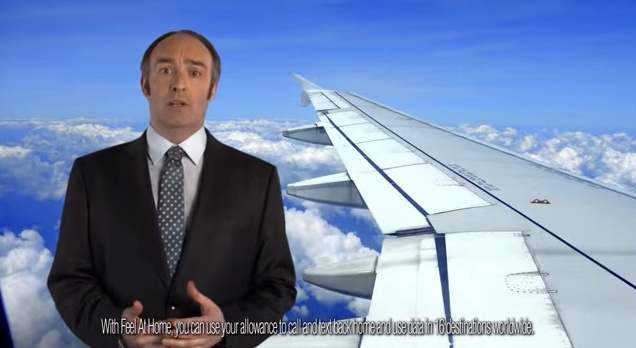 Employing a hilarious approach to promoting its phone service in 16 other countries at no added cost, UK-based Three is out with a Wieden + Kennedy-created commercial in which a spokesman apologizes for "holiday spam." And we're all familiar with "holiday spam." All those pictures of sunsets, cocktails, mini monuments, beach feet, street food, #nofilter, hot dog legs and, yes, the plane wing. Shooting those photos feels great at the time of the shot. But when you're Instagram feed is full of them, it gets a bit tedious after a while. And yes, we know we are very guilty of the practice as well! But the fact that we all engage in this behavior is why we think this ad will resonate so well with people.